Apparently, we still have work to do on the Locost. One day last week we were driving to the office when the engine started missing badly, and backfiring loudly. Embarrassing, but mostly frustrating. We stopped alongside the road and the engine idled fine, but every time we gave it some gas, POW! Obviously the timing was way off. We managed to baby the car back to the garage and drove the Miata to work. 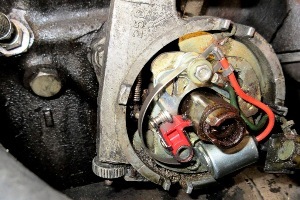 Later that evening we pulled the distributor cap in anticipation of resetting the timing, and noticed that the breaker plate wouldn't rotate the way it normally does. It seemed to be stuck. So we took a closer look, not that we know anything about distributors, but we're car guys which means we have to take a look even if we don't know what we're looking at, or for. Everything seemed to be okay, except for a spring inside the vacuum advance mechanism that was just hanging there, not attached to anything. That didn't seem right. The loose coils at the end of the spring were bent, apparently damaged. We of course had no idea what the spring was for, but we were pretty sure it should've been connected to something. So we pulled the distributor, and managed to do so without extracting the cam drive, which would've messed everything up, but we got lucky. 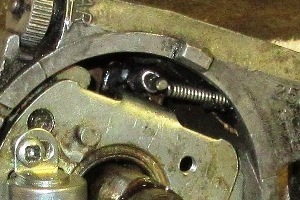 Once we had the distributor on the bench, we noticed right away that the loose spring was jammed between the breaker plate and the distributor body. This was obviously the reason the breaker plate couldn't move. 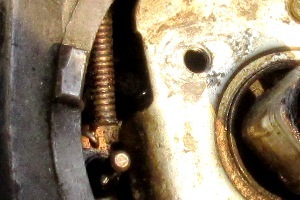 Even better, we found a peg on the breaker plate that looked like the perfect place to attach the spring. But before we could do that, we were going to have to do something about the broken end of the spring. The spring did not appear to be replaceable. The good end of the spring disappeared into some kind of receptacle on the vacuum unit that was reluctant to let it go, even after a lot of tugging, more than is probably allowed. Out of options, we decided the best thing to do would be to bend the last couple of coils of the broken spring into a reasonable simulation of the original end hook, and slip it over the peg on the breaker plate. Which we did, and with the plate now secure, we installed the points, replaced the distributor, set the timing, and cranked the engine. Incredibly, it fired right up. We were a little leery, though, about what we did to that spring. Besides probably weakening it, we obviously shortened it, making it stiffer, which based on our limited knowledge of distributors, and springs, had to adversely affect the timing advance curve, at least in theory. In practice, however, the car runs fantastic, better that ever, which seems to indicate that either a) the spring had been broken for a long time and the advance curve has always been off, or b) we did something else to affect the timing by accident. We're okay with either a) or b). Someday we may replace the vacuum advance unit, but probably not. A quick survey of the resident experts on the M.G. Experience website confirmed that the vacuum advance spring is not replaceable, and suggested that our reconstructed spring would either 1) last forever, or 2) break within a few days. It's already been a few days, so we're going with the former. This decision has nothing to do with our ability to replace the vacuum advance unit, which we're totally confident we could do, and everything to do with its $83 purchase price. We had exactly four days to enjoy our upgraded timing advance curve before we burned up another exhaust valve. 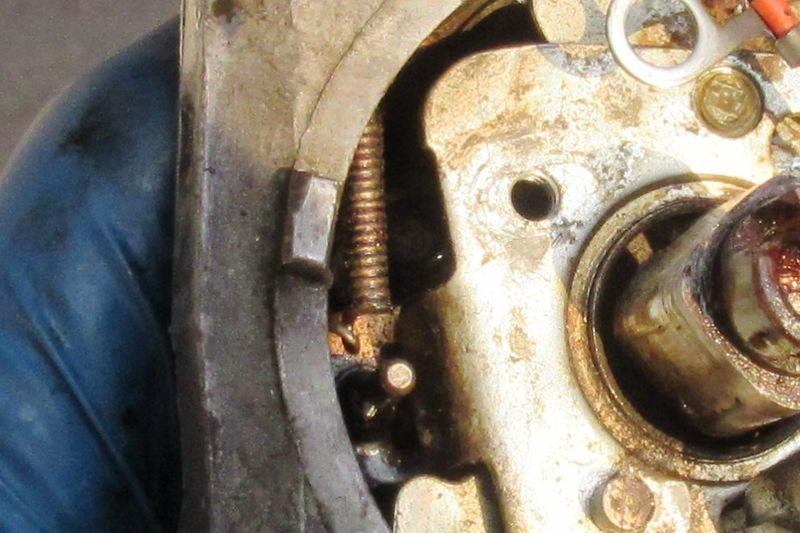 This time the miscreant valve was in cylinder number two, the second hottest in an MGB engine. Long time readers may recall our experience with the number three valve last September, and our reluctance to replace all four valves at the same time. You're no doubt thinking we learned our lesson from that, and we agree we should've replaced the number two exhaust valve while we had the chance. That valve gets almost as hot as number three, and if number three was gone, number two was probably not far behind. 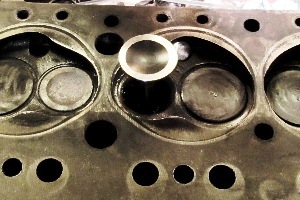 For our first valve repair last September, we purchased a whole set of brand new exhaust valves. Since we replaced only one, we had three left over. 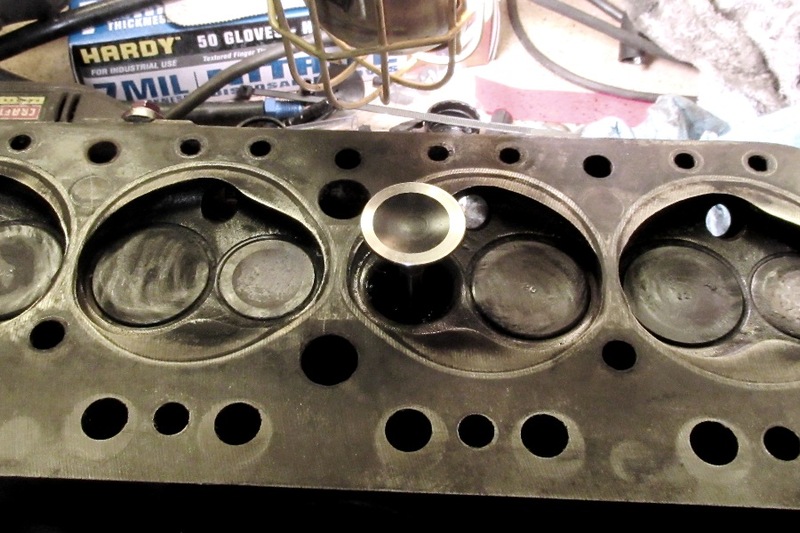 We also had a spare gasket set due to some kind of ordering mix-up, which meant this time we could do the job for free. So we pulled the head, fully prepared to replace all of the exhaust valves, then dug out our $12 tool that Harbor Freight optimistically refers to as a valve spring compressor, and after struggling with the device for several hours, managed to extract the number two exhaust valve. So here's the deal. The number three valve gets the least help from the cooling system, because it's squeezed in the middle and also toward the back of the head. 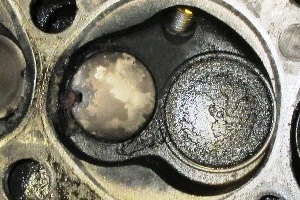 Coolant gets pushed into the cylinder head by the water pump, but only at the front of the engine. Coolant in back doesn't see much action. 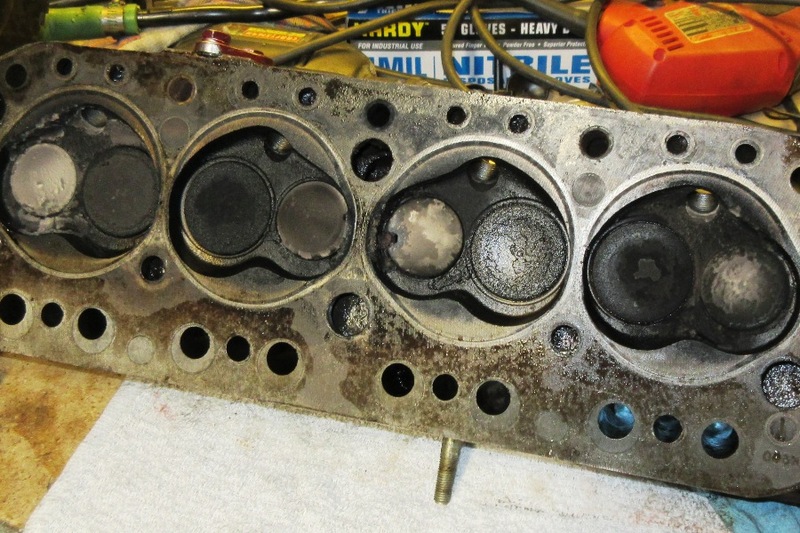 As a consequence, the number three exhaust valve suffers. The number two valve suffers almost as badly, being also squeezed in the middle, right next to the hot number three valve. So obviously neither of these valves lasts forever. Valves one and four, on the other hand, are surrounded by cool water and spaced far apart, a long way from any other heat source. It's unlikely either will ever fail. 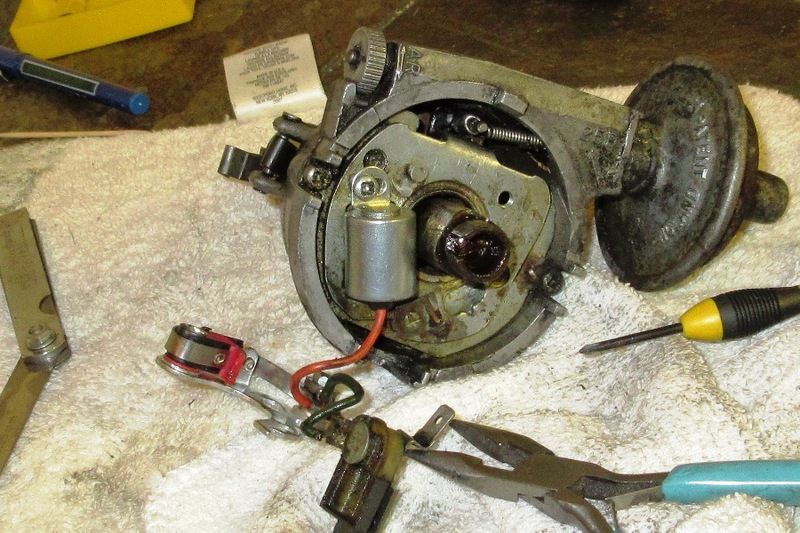 Which is why we decided that attempting to remove them from the cylinder head would be unnecessary, and possibly even a threat to the efficacy of our rapidly-failing Harbor Freight valve spring compressor. So we lapped in a new number two exhaust valve, cleaned everything up, bolted the head back on, and within six hours the car was back on the road with full compression on all four cylinders. At this point we're not going to second-guess our decision to leave the old number one and four exhaust valves in the car, for a couple of reasons. One, the car is running, so obviously we fixed it. Two, we still have spare valves if we ever need them. If we'd replaced all of the valves, we wouldn't have any spares. And three, we're always reluctant to throw away parts that are still working. We could probably find more reasons to justify our actions, but no need. Somewhere down the road the number four valve will burn to a crisp, and we'll have the opportunity then to replace anything we want.